This weekend we did a course on multi pitch clean climbing. The course was originally supposed to be held at the beginning of the summer, but that ended up being cancelled due to bad weather. This weekend was the first available make-up date. After an early start from Basel we meet the rest of the group in Domodossola. 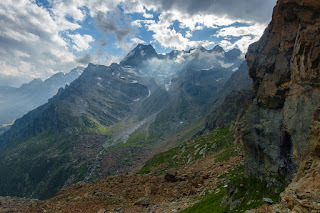 From there we drive to Alpe Devero (walked through this last fall) and then walk to the CAI hut on the edge of "town". 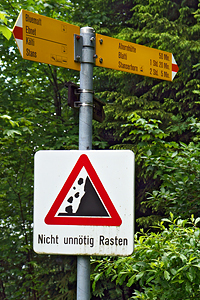 We drop the non climbing stuff and then head up (in the heat) towards the Passo della Rossa. Up up up we go, past a nice flat meadow with an old shelter under a big boulder and a possible tent spot, up up past a strangely sited climbing area, up up up until we hit the foot of the cliff leading up to Punta Esmeralda (unfortunately not really indicated on the map). After a lesson in building a stand we don the climbing gear and do a bit of practicing, reduce the stuff we want to take with us to one pack per rope, and start climbing. Though we are at times next to a bolted route we do the whole thing clean. S, our instructor, moves back and forth between the two ropes to check placements and stands and give tips. 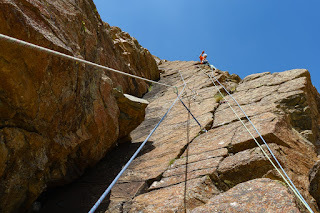 The rock is amazing, the climbing not particularly difficult, and with the coaching it ends up being not as scary as one might think (it's pretty steep and quite exposed climbing). The climbing is over sooner than it seems like it should be. We pack up the gear, make rope "backpacks" and then head down through the scree to return to the rest of the packs (after a short diversion back to the end point to retrieve greg's sunglasses, which had managed to hide during the "we aren't forgetting anything?" patrol). Now it's down down down to a convenient and obvious huge boulder where we cache the climbing gear for the next day. Down down down we go, back to the hut. We have a bit of time to clean up and enjoy a cool beverage before it's time to eat. After the expected good meal we do a bit of planning for the next day and then head off to bed (super bonus: we have a room for five, so it's only us and things aren't that loud). On Saturday we do breakfast at 6:00 (first ones up for sure) and are underway shortly before 7:00. The weather is perfect and the view to the sunlit Punta della Rossa (today's climbing area) is awesome. Up up we go along the same path as the day before. 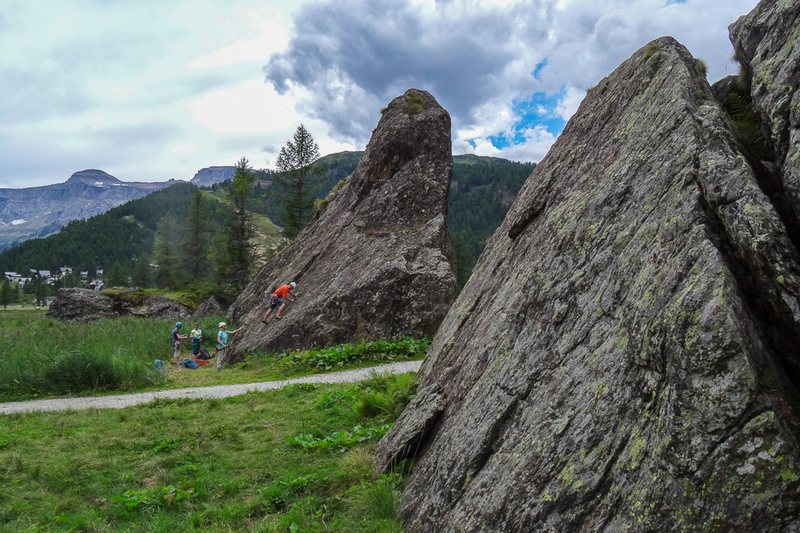 After collecting the cached climbing gear we continue along the path towards the Passo della Rossa. More up up along the path (including a bit of ladder) until we come out onto a saddle above a sea of talus. Here we divert from the path and cross the talus towards the Punta della Rossa, which towers above us. We head a bit up the ridge before hitting the beginning of the climbing route along the south east spur (is that the right translation for "sporn"?). On with the gear, a bit to eat, and then we start climbing. Today instead of having both ropes underway at the same time we go one after another. Andrea and greg are lucky enough to be the first team, so we get to lead the way up the mountain. Today the route is not bolted, but the stands are all pre-built. So we have to place protection while climbing but don't have to build the stands. The climbing is generally not particularly difficult (a bit trickier and certainly more exposed than Punta Esmeralda), the biggest challenge would be finding the route without the bolts there to lead the way. Fortunately S is there to keep us on track. 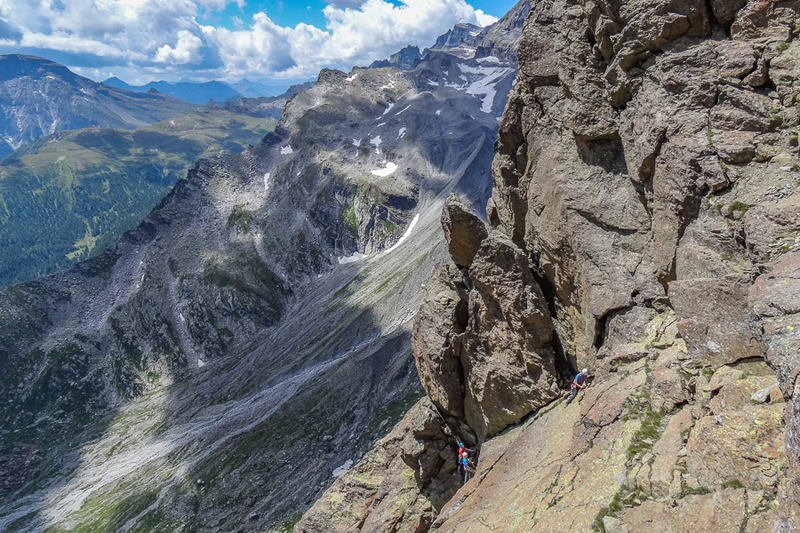 After about five and a half hours of climbing (11 pitches) we reach the top of the route with very tired heads. The view is, as it has been the whole way up, very very nice. We rest for a bit and eat something while waiting for the second rope to finish and join us. 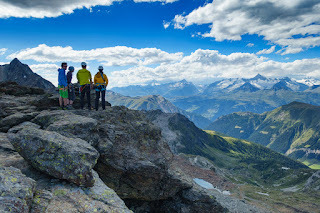 After we've all had a short break we continue on foot to the peak, from which we have a truly spectacular view over the Berner Oberland and the Italian mountains around us. After soaking in the remarkable view for a bit we head back to our gear and pack up for the long abseil down. This goes down a route on the south face and we use a technique that we haven't seen before: three of us go down a pitch on a single rope while the last two follow on the usual double rope. When they reach the stand above us, they untie and throw down the single rope and things continue from there. After five or six repetitions of this we are at the bottom of the face, pretty close to where we started in the morning. After everyone's together we pack everything up and start the long walk back down to the hut. The first piece of this is the route we came up but instead of continuing back across the talus we take a more direct path back down to the valley floor. After reaching the main trail back to Alpe Devero we stop for a quick water (yay! fresh cold spring water!) and snack break before doing the last half hour of descent. We are back late (shortly after 8), but fortunately not too late to get a good meal before heading off to bed. 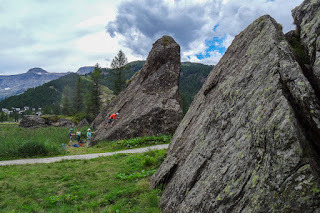 Since we aren't sure what's going to happen with the weather on Sunday and since no one is super enthusiastic about walking back up the same hill again, we opt to head for a crag near the dam above Crampiolo that has a pretty good number of routes. The path there takes us past the lovely witches lake (Lago delle Streghe) and then through the end of town before heading up to the dam. 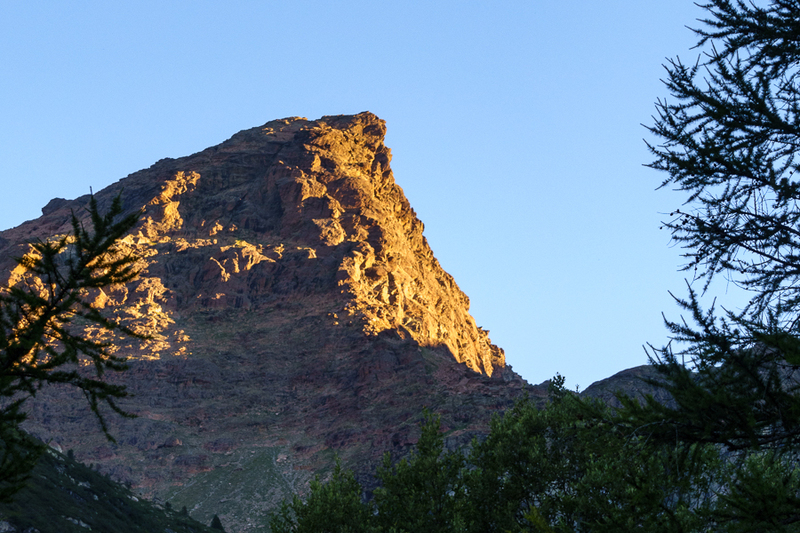 We turn off to the left, climb a bit more, and then we're at the crag. No one else is there, so after scouting for a reasonable area to practice placing protection (nothing really to be found), we start with a couple of the easier routes at the end. These are more difficult than their grades indicate and aren't particularly entertaining after the great climbing of the last couple days. Plus loads of other people show up. We end up opting to skip the climbing and do a few more lessons (tying off a belay to block it, an alternate strategy for organizing the rope at a stand, lowering the person climbing up to you, swapping belay gear for a quick stand-turn-around) before heading back to Alpe Devero. Once there we eat a bit and then head to a big boulder that's not too far away that has a few routes on it, including a few with good cracks for placing protection. Here we do some more practice, including "jump and see if that friend holds" practice as well as a short bit of down-climbing, before heading back to the hut, packing up our stuff, and leaving. The drive back to Domodossola is painless, the trip home less so (lots of delays and train chaos), but we do manage to find a good Kebap in Brig and eventually make it back home.